On Monday December 3, we are launching a new initiative in Maternity. The Warm Baby Bundle will focus on newborn babies who, due to various factors, are considered to be in extra need of skin-to-skin contact. 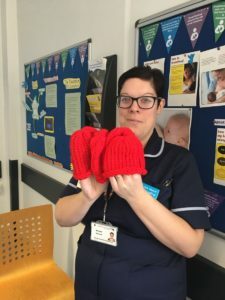 They will be easily identified as they leave the Labour Ward in bright red hats, kindly knitted for us by lots of volunteers. So far we are delighted to have been sent around 300 of the little red hats for these extra-special patients. Parents will be given additional help, with information on cot cards so that they understand the importance of skin-to-skin contact. The red hats were all sent in after the Trust appealed for keen knitters to make them via Facebook. They have come from as far afield as Manchester and Yorkshire in the north and Essex, Hampshire and Wiltshire in the south. ‘The response has been amazing and it means babies identified for the Warm Baby Bundle pathway are easy to identify,’ adds Michelle.